Sony has unveiled four new Walkman models including one that runs on Android 4.0 with FLAC support. The flagship F800 comes loaded with Android Ice Cream Sandwich as standard and full access to the Google Play store through its 3.5in multi-touch screen. This top model also comes with FLAC format support, for those audiophiles who can't live without lossless. It will be available with 8GB, 16GB or 32GB of internal storage, is Bluetooth compatible and has WiFi on board for web access. The other three new Walkmans promise to be pocket friendly in size and price, with smaller 2in screens non-touch screens and a slender 7mm thickness. The S770BT comes with matching in-ear Bluetooth headphones for wireless listening, while the E570 uses a combination of noise cancelling headphones and built-in noise cancelling tech to quell background hubbub. The E470 meanwhile, comes in six different colours and with a selection of games and even a karaoke mode for extroverts. 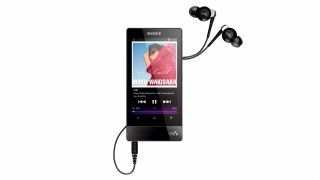 All these new Walkmans are compatible with Sony's Music Unlimited service and support drag-and-drop music transfer from iTunes (non-DRM content) and Windows Explorer. All four new walkmans are available in Europe from today.